Clarke Athletic Training students who partnered with Colt students. A few snowflakes were starting to fall outside on Friday night, January 18th, as students finished unloading the equipment trailer. 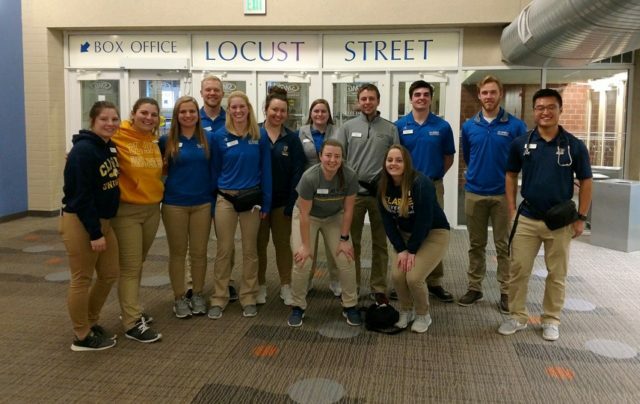 Inside Five Flags Center, the main lobby was packed with students and parents checking in for the rehearsal weekend on one end, and athletic training students from Clarke University on the other. The athletic training students gathered together to go over a few last minute details with Dee Higgins, Ph.D., director of the Clarke University Athletic Training Program, before splitting up and making themselves available for Colts students. Now in its sixth year, this unique partnership with Clarke University allows Colts students the opportunity to have a full orthopedic and flexibility screening prior to the season, while also providing valuable hands-on experience for the students from Clarke. Also on site Friday night was Steven Rock, MD, a member of Medical Associates Orthopedic & Sports Medicine department. Dr. Rock is the forefront expert on concussions in the performing arts and works closely with Athletes and the Arts (www.athletesandthearts.com) to bring the world of marching arts and sports medicine together. In collaboration with Athletes and the Arts, Dr. Rock recently wrote a chapter in “Performing Arts Medicine” by Dr. Lauren E. Elson (Elsevier Publishers) titled, Care of the Marching Musician. Dr. Higgins and Dr. Rock have been involved with the Colts organization since 2009, providing resources, feedback, and ideas to the Colts and Colt Cadets students and staff on a wide variety of scenarios that may arise in a drum corps season. In 2016, Colts added an athletic trainer to the tour staff, and in 2017 Colt Cadets added a health and wellness coordinator to the tour staff. These staff members, along with Colts Director Vicki MacFarlane and Colt Cadets Director Andrew Eaton, communicate regularly with Dr. Rock and Dr. Higgins about the various needs of students while on tour. In 2014, the Colts received a grant from Medical Associates to fund a three-year medical research project to study the effects of the drum corps activity on students. This study provided information on the physical demands students experience during a season of drum corps, allowing Dr. Rock and Dr. Higgins to target their efforts to where students need them most. This study also heightened the Colts awareness of the caloric intake of students, leading to a restructuring of the food program for both corps to help provide sufficient calories to stay healthy throughout a drum corps season. (Read an archived article about the Medical Associates Foundation grant. Last September, Dr. Rock and Dr. Higgins presented to all World Class drum corps directors at the annual Drum Corps International September meetings in Phoenix, Arizona. Their presentation and discussions with the voting membership helped lay the groundwork for the recent Here’s to Our Health: Drum Corps International’s 2019 Annual Meetings and Activity-Wide Health, Wellness & Safety Summit that took place in January in Indianapolis, Indiana. In April, when the Colts color guard and percussion students from Texas join the corps in Dubuque, Dr. Higgins, Dr. Rock, and the Clarke University athletic training students will again be on site to provide orthopedic and flexibility screenings for those Colts students who were unable to attend in January.